Too many Christians don’t realize the difference between meditating on the Bible and reading the Bible. They like to think that whenever they read God’s Word, they’re absorbing the deep things of God. Those who meditate on God’s Word are those who think–and think seriously–about what they’re reading. 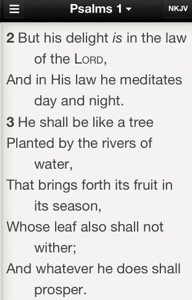 In today’s scripture I quoted from Psalm 1. This psalm begins by defining the person who is blessed, and then points out the right actions of that person. The psalmist wrote that those who meditate–and do it day and night–are like productive trees…and everything they do shall prosper. 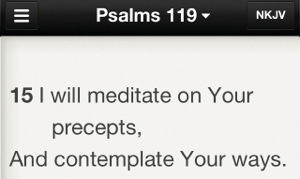 The psalmist made it quite clear that meditating on God’s Word brings results. As you ponder who God is and what He’s saying to you, you’ll grow. It’s really that simple. If you read about and allow your mind to focus on God’s love and power, that’s what operates in you. Be careful what you think about. The more you think about good things, the better your life will seem. The more you think about Jesus Christ and the principles He taught, the more you become like Jesus and the stronger you grow. And as you grow, you win the battle for your mind. Pray: Lord God, help me to think about the things that honor You. Fill my life with a hunger for more of You and Your Word so that in everything I may prosper. I ask this through Jesus Christ. Amen. Before I got to the part with Joyce’s book, I was going to quote something from her. 🙂 I’ve read that book many times. Always learn something new. Thanks.